If you are remodeling or building a home, reading a tape measure accurately is essential. Yet when it is stretched out, a tape measure is a jumble of numbers, marks, diamonds, and other confusing symbols. Once you break it down into a few basics, a tape measure is actually very easy to read. Even if math was not your strongest subject in school, you may be comforted to learn that this has little to do with mathematical calculations. Reading a ​tape measure is more about combining basic fractions with an understanding of how marks work on today's tape measures. Marks on a tape measure are the straight lines that run perpendicular to the tape. Some marks are black and some are red. 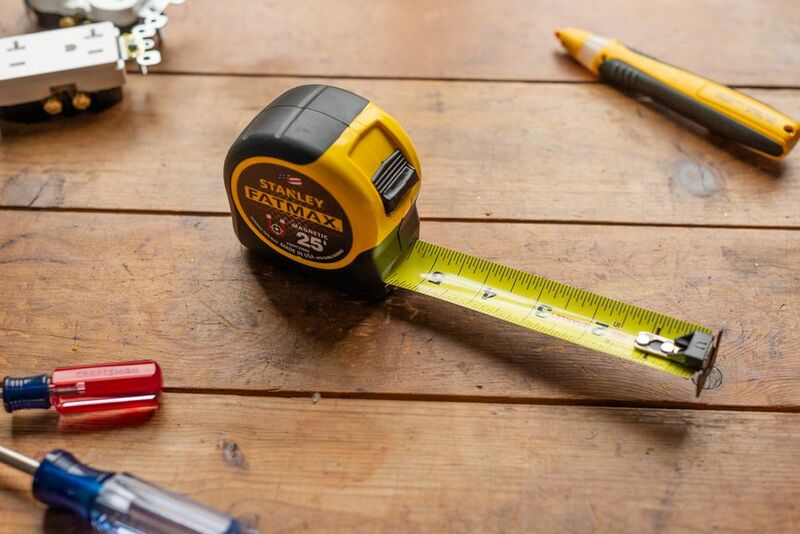 To read a tape measure, think about moving from long marks down to short marks. The longest mark indicates 1 inch. As the length of the marks progressively shortens, the measurements shorten, as well. Marks range from 1 inch down to 1/16 inch on most tape measures. The flat metal hook attached to the tape at the end with rivets is meant to grab onto the end of an item so that you can extend the tape. Without the hook, the tape would reel back, since it is spring-loaded. This hook is meant to slide back and forth. This is so you can measure either by butting the tape against an object or by hooking it on the edge of the object. The sliding motion ensures that you get an accurate measurement in either direction. Whether hooking the tape or butting it, make sure you do so firmly. Often, this little hook is uncooperative about sliding as it should. Unfortunately, the movement on the hook isn't accurate on all tapes, and it can lose accuracy over time. If you really need an accurate measurement and you believe that the hook is not moving properly, you can do a simple technique called "burning an inch." This means that you line up the end of the item you're measuring with the 1-inch mark on the tape. When you take the measurement, just subtract that extra inch that you added. This eliminates any inaccuracy from the hook. You just have to remember to subtract that inch. Tape measures usually have a red mark every 16 inches. This makes it convenient to mark off wall studs or joists, which typically are 16 inches apart. Unless you are dealing with wall studs or joists, you can ignore this marker. Tape measures can be more hazardous to the operator than they may seem at first. Do not let the tape roll back into place at full force, as you can badly cut your finger and damage the tape. Instead, reel it back slowly. The whole inch, or 1-inch, mark on a tape measure is the longest and easiest to see. Foot markers are the longest lines on the tape measure and sometimes extend the entire width of the tape. Most tape measures tell you where each foot mark is located, along with the whole inch designation. This way, for example, you do not need to calculate 36 inches as equaling 3 feet. The whole inch mark is the easiest to read on the tape measure because the number is clearly stated on the tape. There is no guesswork. These numbers usually continue for the entire length of the tape measure. The tape measure's 1/2-inch mark is the second-shortest mark, and the 1/4-inch mark is the next-shortest. Once you get past the whole inch marks, the numbers are usually not stated on the tape. In addition to its length, the 1/2-inch mark is fairly easy to locate because it is exactly halfway between any two whole-inch numerals. Every inch is divided into two halves. The 1/4-inch mark is exactly halfway between any two 1/2-inch marks. Remember that every inch is divided into four quarters. Most people still find this a fairly easy mark to read, as the line is relatively long. Up to this point, it has been easy to read the tape measure. But now, the 1/8-inch mark and the 1/16-inch mark come along and make things a bit more confusing. For one thing, both are very short marks. For another thing, there are so many of these marks that they can get lost in the thicket of other marks. The 1/8-inch mark is located between any two 1/4-inch marks. Most work tends to stop at this point, though in some cases you will need to measure down to the 1/16-inch mark. The 1/16-inch mark is the absolute shortest line on the tape measure. It is also the first line that you will encounter after or before a whole-inch mark.